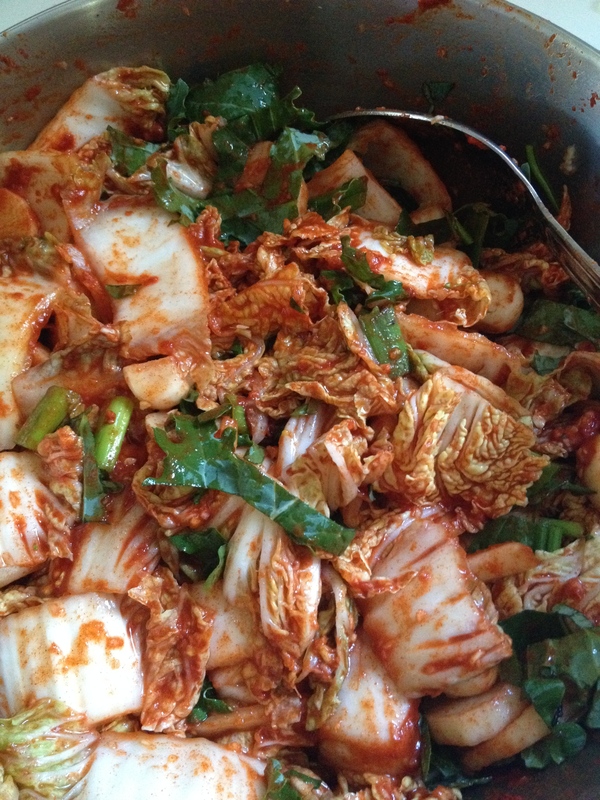 I’ve been asked a few times to post a “normal” kim chi recipe, the ubiquitous kind at Korean restaurants, with napa cabbage and spicy sauce. Your wish is my command. The last time I made this recipe, I was teaching a demo on fermentation to the brand spankin’ new Master Food Preserver class of 2014, and I had the distinct pleasure of horrifying our eminent leader, Nellie Oehler of Dutch extraction, who likes her pickles sweet but still gamely tried a piece of my kim chi. Her face reminded me that this is not a recipe for everyone. But as she said, smiling as she grimaced, “I’ll try anything once!” And so should we all. I like this recipe because it retains the spiciness and color better and has a lovely silky texture, thanks to the porridge made of sweet rice powder that binds everything together. The porridge, I believe, is a style of the south. I never hesitate to throw in seasonal vegetables: the last batch I made contained cubed tiny turnips and young daikon with their leaves from the farmers market (thanks, Groundwork Organics!) and strippings from the aging kale in my garden. You might experiment with fresh new carrots, thinly sliced green garlic, garlic scapes, radishes…the list goes on. If you’re a fan of kim chi or want to see more background on kim chi techniques, you might want to read my daikon cube kim chi and white kim chi with pear recipes, too. Add some shiso pickle and salted cucumber slices with sesame seeds, and you’ll be well on your way to a fancy Korean banchan (set of kim chi dishes that accompany meals). Yield: varies, about two quarts when finished. The night before you plan to make the kim chi, rinse and cut the cabbage into 2-inch square (no larger) pieces. Peel and cut the radish into thinly sliced half-moons. Toss radish and cabbage, then add a brine made out the salt and water. Let mixture sit in bowl on counter for 8-12 hours. Wash your hands, counter, and cooking equipment well. Drain the brine from the vegetables and prepare the kimchi souse and rice porridge. For the porridge, add 1/2 cup of cold water to a saucepan, then add immediately the sweet rice powder. On medium low, whisk the powder into a solution, and cook for a few minutes, whisking constantly, to create a sauce the texture of paste. Let cool on the stove. For the souse, make a paste in a food processor with the garlic, ginger, sugar and shrimp. Mix the souse, porridge, and the red pepper powder into the cabbage and radish mixture well with your hands (you might want to use gloves if your hands are sensitive to spice), massaging spices into the cabbage. Add a little bit of water to ensure everything is nice and pasty, and the souse covers the cubes. Add the scallions, greens, and Asian pear slivers, and mix well. Place the kim chi in a half-gallon or larger-sized glass jar that has been thoroughly cleaned and sterilized. I use a 3L hinged jar without the rubber ring, so I can close the jar but not seal it. It helps to use a canning funnel to get the stuff into the jar — you’ll get red pepper paste everywhere. Let sit on the counter for about 2 days, mixing and pushing down the vegetables into the souse. After it starts to bubble, let rest in the refrigerator for 5 days before eating. You can actually eat the stuff at any point from right after you make it onward, but it tastes better after a few days. It will keep in the refrigerator for a month or so, but the flavor will change over time. *Purchase at an Asian grocery store like Sunrise, available in the refrigerated section. The shrimp should be tiny and bright pink and very salty. **I use Mochiko, a Japanese brand, which is widely available, but you can buy it in bulk at Market of Choice.